TUCSON, Ariz. — Baseball coaches have created the most progressive charts that you can imagine that will track anything of importance in the game. • Victor Solis’ Range Factor Chart on defense. • Todd Naskedov’s Pitching Performance Chart. • Kenny Kendrena’s Freebee Chart. • Kenny Kendrena’s Daily Defensive Standards Chart. • Jason Hisey’s Total Production Chart. • Cosumnes River College’s Scouting Chart. • Inside Edge computer charting system. Victor Solis, Head Coach at Paradise Valley Community College (Phoenix, Ariz.) and a former assistant at the University of Arizona for five years and Army for two seasons, is considered one of the top defensive instructors in baseball. He utilizes a Range Factor Chart for his players to track three key areas of his defense: (1) Balls hit in the direction of the player and his success (successful plays divided by balls hit in your direction), (2) Should Make Success (successful plays divided by should make), and (3) Actual Attempt Success (successful plays divided by actual attempts). “This chart shows very quickly who makes the routine play, who has tremendous range and who can make the spectacular play with great range,” said Solis. Solis said breaking down the type of errors his players have is important also. Todd Naskedov, pitching coach with Pima Community College (Tucson, Ariz.), is one of the up and coming pitching coaches in the nation who has vast knowledge on improving pitchers. He has a tremendous track record for ramping up the velocity of pitchers as they become more athletic in their deliveries. They also improve their command by studying video. In addition, he is keenly aware of how to refine their mental/emotional outlook during games so they become tough competitors during contests and are able to come back from momentary setbacks. Naskedov pounds home the importance of getting ahead in counts with his pitchers. This area has always intrigued him after hearing long time Major League pitching coach Rick Peterson discuss the subject at one of his clinics. “Our approach is based on the idea that we want our pitchers to throw two out of the first three pitches for strikes, or for the batter to put the ball in play before that. We keep a detailed pitch performance chart which tracks how opponent hitters do when at-bats are resolved early in the count (0-0, 0-1, 1-0, 1-1), ahead in the count (starting from 0-2, 1-2), or behind in the count (starting from 2-0, 2-1). After 46 games this season, his chart showed some staggering numbers. When his pitchers got ahead in the count, the opponent on-base percentage of hitters was .179. But when they got behind in the count, the on-base percentage of hitters skyrocketed to .470. “The opponent on-base percentage is even lower when you factor in batters who get on via walks or hit-by-pitches,” said Naskedov. “Our statistics show that the on-base percentage drops 45 points to .134. Naskedov said that when hitters put the ball in play early in the count, or are hit by the pitch (0-0, 0-1, 1-0 or 1-1), then the on-base percentage is .332. “We firmly believe that the .332 on-base percentage for hitters early in the count is important to look at as well. Batters are not wearing you out at that number. So we want our pitchers to be aggressive throwing strikes early in the count. 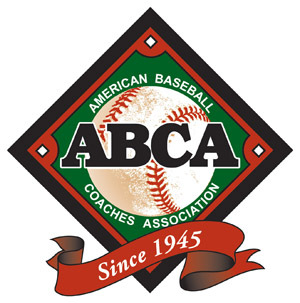 Undoubtedly the most progressive high school baseball coach in the USA when it came to utilizing statistics for his players was Kenny Kendrena, former head coach at Bishop Amat H.S. (La Puente, Calif.). Kendrena, who now works for the baseball statistics company called Inside Edge, reviewed his game statistics on Microsoft Excel. But he expanded on that by implementing a daily defensive standards’ chart along with his freebie chart. “We kept what we call a Freebie Chart. I got the idea from Head Coach Brian Shoop, then of Birmingham-Southern College. 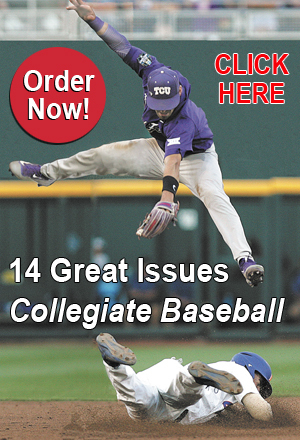 “I purchased an American Baseball Coaches Association video package and heard his talk. He explained that the winner of the freebie war during a baseball game will usually win games. He defines a freebie as a hit by pitch, walk, wild pitch, passed ball, balk, error, miscommunication, fielding error, failed bunt/slash, runner picked off, poor baserunning, runner in scoring position with no outs and didn’t score, hitter chased ball four, among others. Kendrena’s stat tracking ability was forever changed when he contacted the Inside Edge company in 2003 and made several suggestions for new electronic charts. For more on this, see how Kendrena has utilized this program later in this article and why this is undoubtedly the future of charting. The former skipper at Bishop Amat H.S. said he still kept a defensive chart with paper and pencil which was transferred to his Microsoft Excel program. “We had a Daily Defensive Standards Chart which we posted every day. It kept track of touches and mistakes. The mistakes were then defined as fielding or throwing mistakes so we knew what to work on with the specific players. It is interesting to see what percentage of clean plays we have, great plays, mistakes that were throwing and mistakes that were fielding or communication errors. One of the most progressive college baseball teams in the nation in regard to statistical charting is Pima Community College (Tucson, Ariz.). • Converting outs for runs. • Freebie totals (walks, hit by pitches, errors, stolen bases, wild pitches, passed balls). • Irontec weight training and running program. According to Hisey, there are two central areas that are vital in the hitting philosophy utilized by Pima. “The first is on-base percentage as opposed to batting average and also well hit balls as opposed to base hits,” said Hisey. He said that when he pitched at the University of Arizona, he learned quite a bit about key hitting stats from renowned batting instructor Jerry Stitt. “Coach Stitt had a well hit category that he looked at closely with his hitters. You would like to see 40-plus percent of hits being well hit. “Then you divide that by gift outs (popups or strikeouts). We found that the gift outs cancel out the hard hit balls. Then we look at base running. Our entire concept at Pima is built around trading outs for runs. All of our rules on the base paths are structured to get runners to third base with less than two outs. “Our process chart shows how many times we converted outs for runs. And we should convert 75 percent of the time. Then we have a category called 2-out conversions. “When you get a guy in scoring position with two outs, how do you convert? We should convert about 25 percent of the time. If you have an open base with a runner in scoring position, you will be pitching a little differently, especially in a wood bat league like we play in. “When well hits are divided by the gift outs, plus the outs traded for runs scored, plus 2-out conversions, you should get a score close to 2.00 on our level of play (Arizona junior colleges). We base everything off that number. We now have a process point where we look at players in the relationship of 2.00. “If a hitter exceeds gift outs with well hits, he might be at 1.35 or 1.45 prior to adding in third base conversions or 2-out conversions. And his figure might be 2.65 or 2.70. When I was coaching in high school (Catalina Foothills H.S. in Tucson, Ariz.), we had kids with crazy numbers that were close to 3.00. But that showed we had superb high school hitters going against average high school pitchers. “At the junior college level, the numbers are more consistent. Being able to trade outs for runs at this level when the wood bat is in play is vital especially in a 7-inning game. When you get those guys on third base with less than two outs, you’ve got to get them in. And that’s the process point we focus on with the kids. Hisey said Pima coaches do not post the charts for players to see as they previously did. Hisey said that emphasizing the process points within the entire picture is important with his players. “We stress outs for runs, scoring 75 percent of the time with runners on third with less than two outs. In addition with a guy in scoring position with two outs, we should score 25 percent of the time. With pitching and defense, Hisey said the goal is to eliminate free base runners while the batter is hitting which factors in walks, hit batters, and errors. There also are free bases while you are on base which includes wild pitches, passed balls, balks, and stolen bases. “We try to win the freebie war, which was described by Bobby Miranda of Georgia Tech. a few years ago at the American Baseball Coaches Association Convention in San Diego. “Pat McMahon (former head coach at the University of Florida), another superb coach, explained how the 3-headed monster of big innings generally occur by a hit batter, walk or error. With this information, we try to explain to our players that this is what leads to multiple run innings for us and against us. Then we try to isolate that down to a process point. “In a 7-inning game, we want to be ahead in the freebie war by a 2:1 ratio as we are gaining twice as many free bases as we give away. In a 9-inning contest, we want to be ahead by a 3:1 ratio in the freebie war. In general, you want to limit your free bases to opponents with only one every two innings. So if you play nine innings, and give up five free bases by any combination of walks, hit by pitches, wild pitches, passes balls or stolen bases, that is a quality game in that area. Hisey was asked how he charts, within the freebie war concept, an opposing batter who purposely gets hit by a pitch which has become common in college baseball today. Does he reduce the penalty a pitcher sustains because of this suspect freebie? “No, not at all. The pitcher gets the full penalty. When we are on offense, we promote guys getting on in this fashion. We believe that hit by pitches are rally starters. It doesnâ€™t matter in our charts if a batter leans into a pitch with his knee. The guy is on base. “At the end of a game, we might win the freebie total, 13-10. It is all relative to who you are playing that particular game. If you are playing Yavapai J.C. at their place, you might intentionally walk 3-4 guys during a game or pitch around guys. Hisey was asked if he has ever seen a team register zero freebies in a given game. “Sure I have. But they are extremely rare, especially on the junior college level. As far as the highest freebie figure by one team, that might be 15 or so. They can add up in a hurry. If a pitcher walks six guys, you are almost half way there. Then if you add in a few errors, passed balls or wild pitches and other things. It is not as difficult as it may seem to hit a 15. A successful double steal would be worth two freebies. Defensively, Hisey said that Pima strives to make opponents string together three hits in an inning to score one run and five hits to get two runs — not the other way around. “On defense, we don’t want to allow three runs on one hit (a walk, hit batter, error and then double which would be three runs on one hit) or five runs on two hits. On defense, we would prefer it to be hit, hit and hit which would be one run. “With regard to pitching, we look at hits per inning. But even more important to us is walks per innings pitched. If you are not walking batters and letting them earn runs, it is very tough to string together three hits in a row. Pima’s Soto said the entire statistical charting system has worked tremendously. “I used to be so caught up with the teaching of mechanics. What I have found is that most of the time, the body will probably do the right thing if you get enough repetitions with the concepts you teach. You obviously must teach some basic things. But we get so caught up in mechanics that sometimes you don’t let the kids utilize their natural athleticism. “Brent Strom has said for years that pitchers from the Dominican Republic will come to the United States throwing 93-94 mph. But once they become Americanized as U.S. coaches tinker with their mechanics, suddenly they only throw 87-88 mph. We over coach at times. “Sometimes it is best to allow your kids to stay aggressive in hitting but also be tactical about it as well. “A lot of the concepts we use at Pima remind me of the Marine Corps. When you have a drink of water in the Marines, you learn to cover the cup with your hand as you walk. You say things in a certain way or march in a certain cadence. After a period of time, you finally realize why all these concepts have been taught. “Guys in our program learn that base running drills are done for a specific reason with the intent of scoring runs. The light clicks on in their minds after we go over our concepts and the reasons why over time. Once the kids buy into the different concepts, great things happen. Hisey said that teaching is at center stage during as coaches work with the players at Pima. “During the fall and early portion of the season, we verbally stress what we are striving to do. We talk about converting runs with a runner at third and less than two outs or converting runs with a runner in scoring position and two outs. “The hitters become educated in gearing up for a certain pitch in certain scenarios or taking a chance on the base paths as situations dictate. Another element of the Pima system is their superb weight training system which pushes the athletes to new levels of athletic achievement. Every aspect of training is documented as they progress from month to month, whether it is weight training or the running program. “It is a tremendous motivation and psychological tool,” said Hisey. “We reward the top 20 percent of our players with an Irontec shirt after they complete 10 modules through the fall. There are five agility tests, three strength tests, a mile run and an eye-hand coordination test. Hisey said that when all of these statistical, physical and psychological elements merge together, it allows for a special kind of success on the field. The future of charting has arrived thanks to the good folks at Inside Edge. You can tap on categories such as swung and missed and even have the screen function so that you can track where the catcher sets up and where the pitch actually arrives. 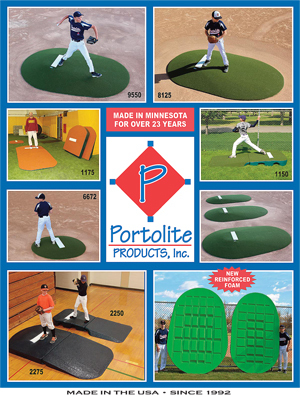 You can track opposing pitcher tendencies quickly with this system. Once the game is finished being entered, you send the data to your main computer in your office or home and then have the capability or printing out numerous sophisticated charts for offense, pitching and defense. Game after game is done this way which allows you to have one area to mine data instead of trying to sift through hundreds of written charts in a binder. When Kendrena became involved with Inside Edge, he utilized such stats as the pitcher report card, quality locations report, well-hit average, among many other reports, that has allowed him to tap virtually every facet of the game from a statistics view. His methods for tracking stats can serve as a model for any coach since he utilized this information to teach his players to be more proficient in the skills that might be lacking and gave keen insight into why they were having success. “To me, it’s all about tracking stats that matter,” said Kendrena, who coached nine years with Bishop Amat H.S. (La Puente, Calif.). Kendrena was asked how his stat tracking system evolved through the years. “I was keeping paper charts that probably weren’t like other coaches’ charts. One that I really liked was the quality at bat chart which I came up with in 1999. Many coaches use something similar to this. But ours gives a point value. For instance, a bunt is worth a certain number of points. A seven-plus pitch at-bat is worth certain points. Kendrena said while he is a stat tracker, he never publishes normal stats for the team to read. Kendrena wanted to emphasize that he is not some computer guru who only focuses on stats with his team. Kendrena said his quest for more significant stats that would help his team pointed him toward baseball computer software company Inside Edge and their program called PalmScout. This powerful software has a number of reports such as the Pitcher Post Game Report, Pitcher Team Ranking, Pitcher Location Report, Pitcher Evaluation, Pitch-by-Pitch Report, Pitcher Report — Detailed At-Bat, Pitcher Report Card, Quality Pitch Location, Pitcher Command Report, Hitter Team Ranking, Hitter Location Report, Hitter Evaluation Report, Hitter Report — Detailed At-Bat, Spray Chart Report, Game Report, Pitching Chart. Information in these reports can be obtained by clicking on certain teams and individual players from certain games or multiple games or seasons. They can include your team or opposing teams. Kendrena said the three charts that he specifically asked about with Inside Edge was the Pitcher Report Card, Quality Locations Report and Pitcher Command Report. Recently Inside Edge came out with the Hitter Report Card. He said that these charts reveal strengths and weaknesses of his pitchers like never before. Instead of utilizing paper charts as in the past, Kendrena now utilizes a Palm Pilot as he charts pitches in the bullpen, during intrasquad games and during games. The Pitcher Command Report shows how well pitchers hit their intended spots. Not only will it display all the pitches in a given outing, but for combined outings as well if the report is set up in this fashion. You are able to run it after one bullpen, or show a pitcher his command over the last four intrasquads, for example. You can change the criteria to have it display pitches attempted to specific spots, such as fastball down and away. Pitchers then have a better feel for their strengths and weaknesss in terms of command. One report which many coaches have found indispensable is the Pitcher Report Card. There are nine main categories where a letter grade is assigned just like in school. Within those main categories are 26 different key stats that show the percentage of success and the Major League average for those categories. • Working ahead in count (1st pitch strike %, 1 of first 2 pitches for strike %, 2 of first 3 pitches for strike %, % of 0-1 counts that become 0-2 counts, % of 1-1 counts that become 1-2 counts). 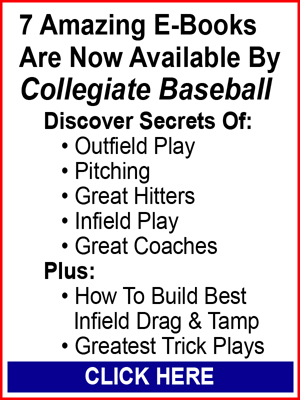 • Fastball command (Quality pitch % all fastballs, Strike % of fastballs). • Off-speed command (Quality pitch % off-speed pitches, Strike % of off-speed pitches). • Finish off hitters (2 strike at bats becoming outs). • Off-Speed effectiveness (% of off-speed strikes not well hit, % of off-speed pitch chases). • Overall effectiveness (Well hit avg. of balls in play, Well hit avg. of strikes, OB% against the pitcher, % of batters faced who score, Take strike % of pitches other than 3-0 count). • Dominance (% of outs that are K’s in 4 pitches or less, 1-2-3 innings % of all innings pitches, Swing and miss % of strikes). • Efficiency (% of at bats that go to 3-ball count, 1st batter of inning out %, 4 or less pitch AB’s). • Battle tendency (LOB% – the % of time any baserunner does not score, % of 2-0, 2-1 and 3-ball counts ending in out, % of runners left in scoring position). Scouting opponents is essential to getting an edge on your opponents. One of the best coaches in the history of baseball who utilized scouting every conceivable way was Jim O’Brien, former Hall of Fame head coach at Los Angeles Harbor College for 15 years. He led the Seahawks to three California State Junior College titles in 1978, 1984 and 1990 with an overall record of 460-171-2. In 1990, Harbor College set the state record at the time with 51-5 record. He led the Seahawks to 11 conference titles in 15 years. Earlier in his career, he was the coach at North High School (Torrance, Calif.) and led his teams to two CIF championships and won conference titles eight times in 12 years with a 234-88-4 record. He was a skipper for 27 total years before he retired and was involved in the game for over 40 years as he was inducted into the California Community College Hall of Fame and Harbor College Hall of Fame. Known for his remarkable coaching, over 40 former players ultimately became head coaches on the high school and college levels. One of the key components of his system was scouting opponents with precision detail. Twice a week during the high school season, every one of his players would be responsible for scouting different opponents that North High School would play during the season. As a college coach, his family often got into the act by scouring through sports pages in the different newspapers at the cities that opposing schools were located in. No stone was unturned in the quest for knowledge of opponents as reports were typed up for each team and filed away in his “Blue Bible”. All of this was done prior to the use of the internet which coaches commonly use now to secure information about opponents since statistics are routinely posted by many teams on their web sites. But there is still no substitute for watching ball games in person to pick many details you can’t with a stat sheet. Non-starters in O’Brien’s dugout were responsible for tracking everything conceivable during games. Not only did they keep five charts which included extensive data on opponent pitchers, his pitchers, opponent’s running games and special plays on opponents, including first and third plays, but several players watched the opposing pitcher like a hawk to see if he was tipping pitches. Another player was responsible for watching the catcher to see if he was tipping pitches by the movement of his body on the different pitches. Still another watched his teammate pitch to see if he was tipping any pitches. If he spotted something, he told the pitcher between innings which would clean up the problem. To get his players more into the game, O’Brien kept a 5 foot wide x 3 foot high dry marker board in the dugout which vividly showed how each opponent’s hitter was doing in the game. It included what the batter did and where the balls were hit. In 1990, O’Brien fielded his best team which had a 51-5 record. “I have never let this cat out of the bag. Over the years in our charts, my assistant Tony Bloomfield, now the outstanding head coach for Cosumnes River J.C. in Sacramento, saw a fascinating trend after numerous lefthanded pitchers were thrown against our ball club. “We were a small ball, running type of team which utilized plenty of speed and swiped a lot of bases. That is why we saw so many lefthanders. We had to create runs and were very aggressive on the bases. “In 1990, we discovered that lefthanded pitchers early in the game, usually the first or second inning, always had a habit of going to the plate at least once before trying to pick off any of our runners. “We put in an automatic rule. Whoever got on base first with a lefty on the mound would automatically steal second on the first move by a lefthander early in the game. Tony would help by utilizing his big, booming voice by yelling, ‘He’s coming over! He’s coming over here! It was all a decoy. And our opponents never did catch on. We did this in fall ball and regular games. We even did it in the post-season with great success. O’Brien was asked what he looked for when he scouted opponents. “We looked for their strengths and weaknesses. We then would figure out how we could take advantage of that information. O’Brien also notices whether pitchers will throw inside. “Some pitchers rarely come inside. And some coaches are reluctant to have their pitchers throw inside. They want all their pitchers to throw the same way. That is valuable information to know. One time we saw a kid warming up, and he was having trouble throwing strikes. His coach was working with him in the bullpen, and we thought we would have a field day against him. “To the first batter, he went 2-0. The next pitch was a changeup for strike one. Then with a 3-2 count, he threw a curve and got our hitter out. He was superb the rest of the way, and we didnâ€™t win that game. Those type of pitchers can give you fits. “Another thing we look at is how the home team plays on their field. Different teams have different home field advantages. In our area, Golden West J.C. gets a breeze off the ocean. The ball flies out of that place and carries very well. Every time we played there, I didn’t want our outfielders to get beat by fly balls over their heads. I didn’t care if they played next to the wall as long as fly balls didn’t go over their head. O’Brien said there are many different charts in use today. “One is not tremendously better than another. Coaches should be comfortable with what they are using. I have found above all else that it does no good to keep charts if you don’t use the information. I see that a lot and had it happen on my teams. O’Brien said that if you have great information on teams and know that you will go up against a superb pitcher, you may have to change your approach on offense. Jerry Stitt, former head coach at the University of Arizona, is recognized as one of the best hitting instructors in the business. He has utilized an offensive production chart for years which gives points for every conceivable offensive performance. “A double is worth two points,” said Stitt. “A walk would be given two points — one point for getting to first base and another for walking. We give points for moving a runner or runners. “We give points for RBIs. More are given when there are two outs in the inning. Hard hit balls that are caught are given three points. Hard hit balls that are not caught are given four points. “We give three points for the leadoff man getting on and four points for a successful squeeze play. “We also have negative points which add up as well. Strikeouts, easy fly balls, grounding into double plays, base running errors and non-productive outs are all given negative points. The final point total is divided by the batting attempts (not at bats). Stitt said it is important to track how runs are scored and dissecting how it all happens with a particular team. “It is important to know if hitters are able to move runners from second to third with nobody out. As a hitter, you must be able to do that. I want to know who can collect RBIs with less than two outs. Everyone talks about driving in runs with two outs, and that is tough to do. 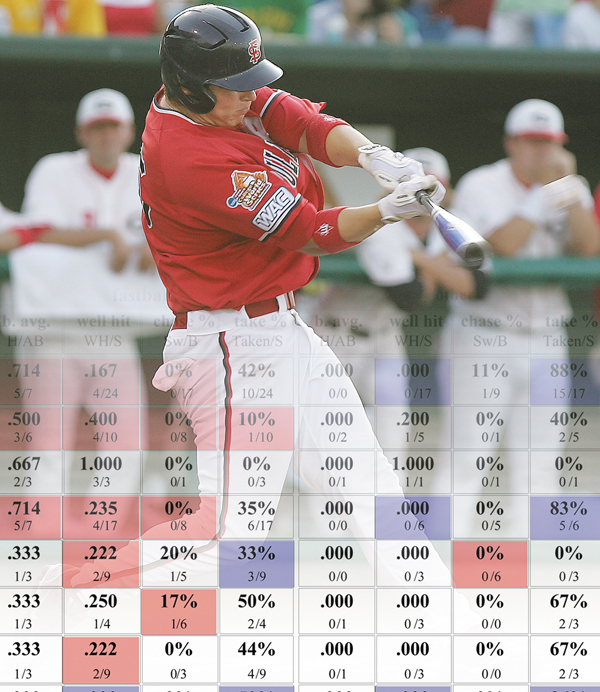 “Keeping track of well hit average is important. It is so much more important than batting average. This indicates to a coach how well the kid hit the ball. Many times base hits are an element of luck. How often have you seen defensive players over shift, and the ball barely falls in while a line drive is caught. Great job. Very useful and helpful information for those coaches who want to elevate the success of their teams.